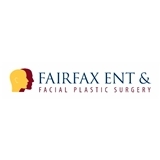 Fairfax ENT (Falls Church) - Book Appointment Online! ***PLEASE VISIT http://www.fairfaxent.com/ TO FILL OUT FORMS PRIOR TO APPOINTMENT! Dr Blank was quick and to the point, asked me the questions she needed to make her diagnosis, and then gave me a clear diagnosis and a detailed treatment plan. She answered all of my questions and explained what was happening very clearly. Great doc!